The Haunted Screen by the film historian Lotte H. Eisner (1896 – 1983) has been an inspiration to me since I read it in the early 1970s. So revered was Eisner by German film director Werner Herzog, that in 1974 on hearing she was dangerously ill, he began to walk from Munich to Paris to see her, convinced that she would stay alive because he was on his way. She recovered, and he wrote a book about the experience, Of Walking in Ice. The Haunted Screen is an account of the ‘Golden Age’ of German cinema, which began at the conclusion of the First World War, and ended shortly before the coming of sound. (1918 – 1927) German film-makers during this period were influenced by two primary sources: literary Expressionism, and the work being pioneered in the theatre, particularly by the director Max Reinhardt. 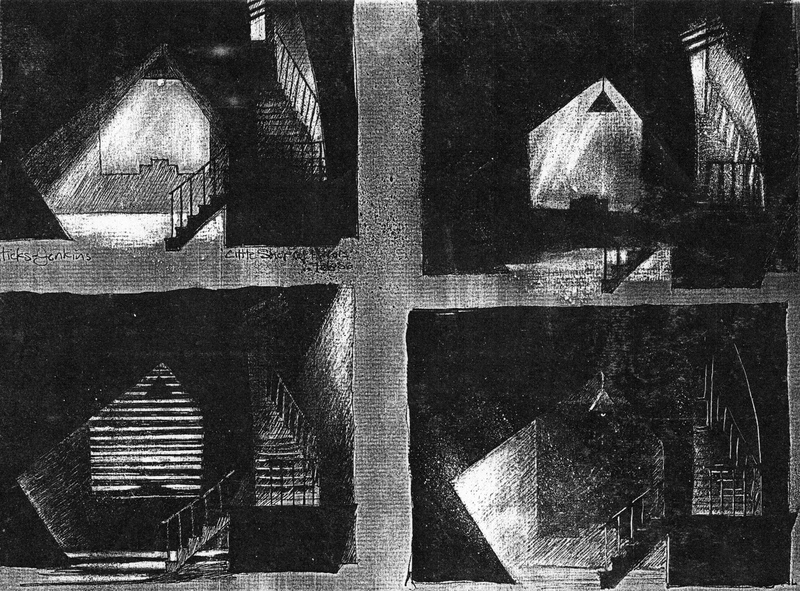 Eisner demonstrates the connections between German Romanticism and the cinema, through the influence of Expressionist writings. The following quote from an interview with the film director Paul Leni in the magazine Kinomatograph, is included by Eisner in The Haunted Screen, and has stayed in my mind throughout my working life. Leni is speaking of film design, though for me what he says applies equally to painting. ‘This is particularly necessary for films set wholly in a world of unreality. 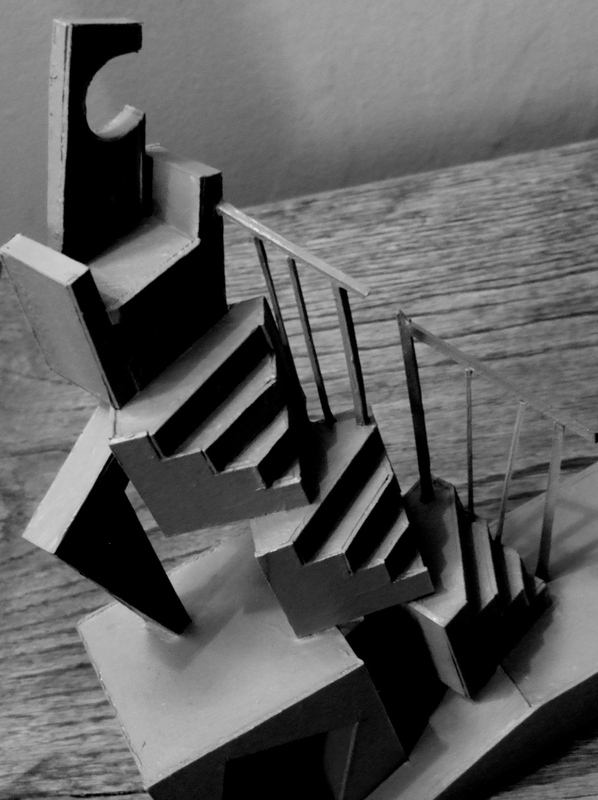 For my film Waxworks I have tried to create sets so stylised that they evince no idea of reality. My fairground is sketched in with an utter renunciation of detail. 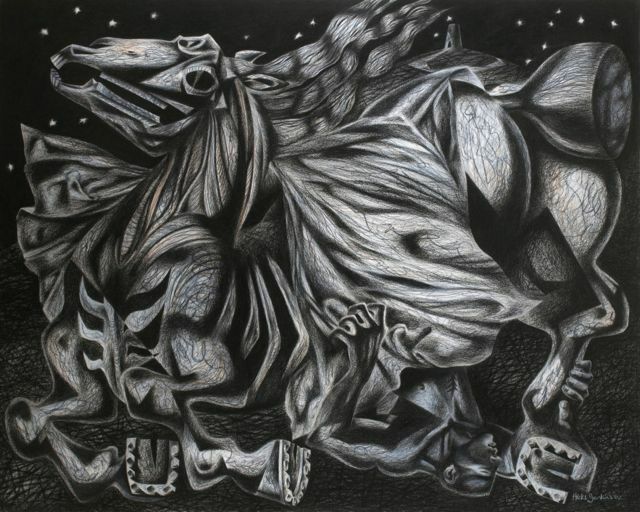 All it seeks to engender is an indescribable fluidity of light, moving shapes, shadows, lines and curves. It is not extreme reality that the camera perceives, but the reality of the inner event, which is more profound, effective and moving than what we see through everyday eyes, and I equally believe that the cinema can reproduce this truth, heightened effectively. 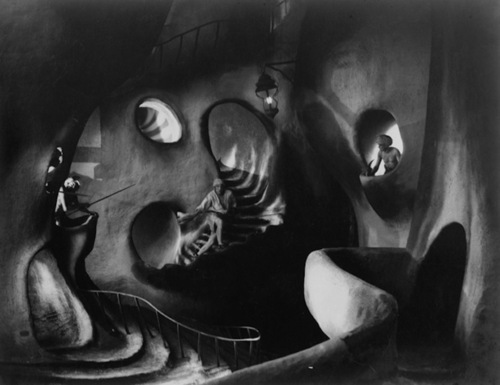 I may perhaps cite the example of Caligari and The Golem, in which Hans Poelzig created a town’s image. I cannot stress too strongly how important it is for a designer to shun the world seen every day and to attain its true sinews. At this distance Leni sounds to be a tad bombastic, but at the time I first read his words I was drawn to the visual ‘Expressionism’ he posits. However, even better is Eisner’s description of the Jack the Ripper episode from Leni’s Waxworks. (It’s quite short and comes at the end of the film.) In fact so thrillingly does she write, I’ve always found the sequence itself palls in comparison with her words. 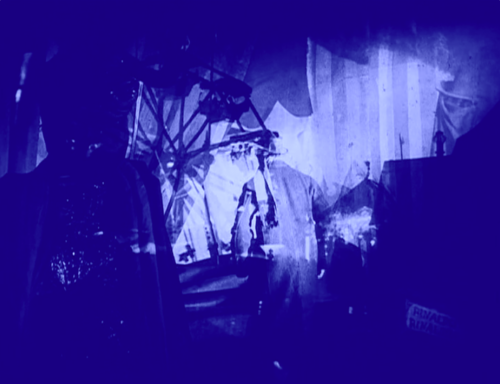 Above: the Jack the Ripper sequence from Paul Leni’s Waxworks. 1924. Multiple exposures create a transparent layering, and the Ripper seems more a phantom than corporeal. That’s him in the centre of the image, his back to the viewer, heading toward the fairground. It was Eisner’s description of that sequence… rather than the sequence itself… that guided me in 1986 when I worked on the design and the lighting for the ‘Expressionist’ production of Little Shop of Horrors that I directed at Theatr Clwyd. And it was the same description that I returned to when I first heard Mark Bowden’s music for The Mare’s Tale, which for me was redolent of the Expressionist imagination Eisner had so evocatively conjured in The Haunted Screen. 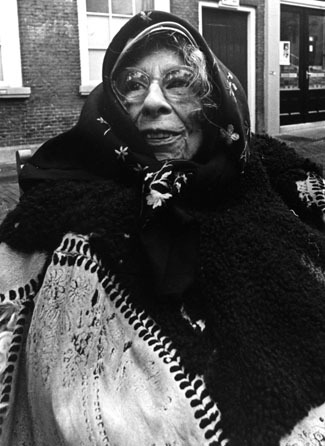 Below: the great Lotte Eisner, who opened a door for me. This entry was posted in Looking at Art and tagged Hans Poelzig, Lotte Eisner, Paul Leni by Clive Hicks-Jenkins. Bookmark the permalink. Yes, I’ve got her Murnau book as well. Also read her Fritz Lang book although had to go to a library for that one. I suppose I could order it from Abe now. The Haunted Screen for me has always been like Philippe Jullian’s Dreamers of Decadence, I only have to flick through the pages to start getting ideas. Absolutely. It’s like a bottomless well of inspiration. I never tire of it, and never fail to find something new to engage me, even though I must have read it twenty times. that cave-like set from Waxworks is just amazing! I haven’t seen that film. You can view Waxworks if you click on the link in the text. The film is at YouTube. I have greatly enjoyed this project. Puppets, stop-motion, an Expressionist set and a psychological ghost story! What’s not to love? Ah ha! Indeed. 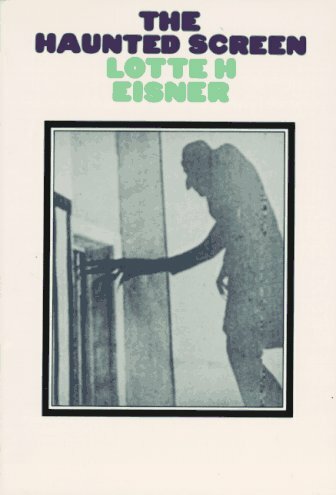 My dog-eared copy of Eisner’s book is never far from my hand, and I suspect that you too find much inspiration for your work between the covers of The Haunted Screen. Have you ever read her book about Murnau?